May 31, 1900 – At noon a Northwestern Elevated Railroad train carrying invited guests enters the Union Loop and “the new road, the last one to be completed of those composing the great elevated railroad system of Chicago—the greatest in the world—was formally opened.” [Chicago Daily Tribune, May 31, 1900]Twenty minutes later the train is speeding northward, having circled the Loop, carrying 250 passengers, all guests of the company. It takes 22 minutes to reach the northern terminus of the line at Wilson Avenue. On the way the train passes five trains headed south, all packed with paying passengers. It is a BIG DEAL. The Tribunereports, “Along the entire line of the road the windows were filled with people, who cheered and waved their handkerchiefs as the four cars composing the first train rolled by. Tugs and factory whistles violated the anti-noise ordinances in the most flagrant way.” The guests on the train disembark at the Wilson Avenue station and make their way to Sheridan Park, a station on the Milwaukee Road, where lunch is served. Afterward a ceremony is held on a temporary rostrum. 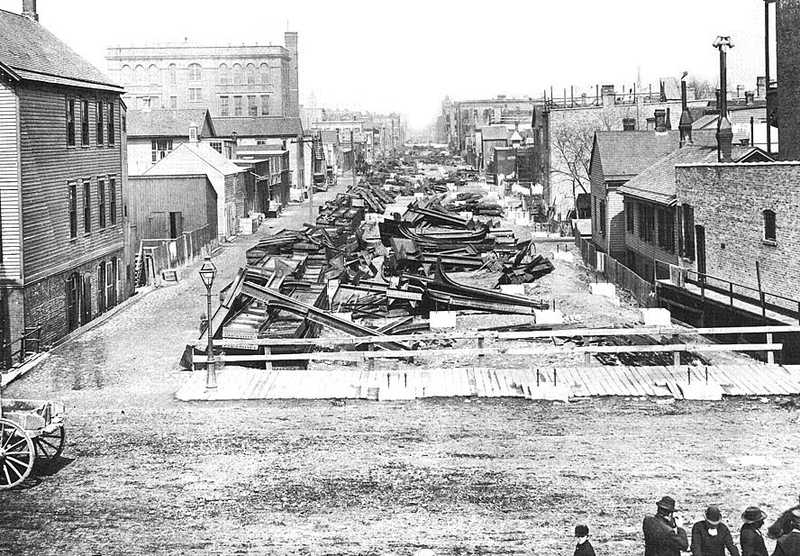 The Chicago Commissioner of Public Works proclaims, “The completion of the road marks an era in the history of the North Side and will tend to the development of this part of the city.” The President of the railroad, D. H. Louderback, says, “We intend to make our road the best in the country. Its construction is perfect, and with its four tracks it is the best and most flexible in the city. We will aim to accommodate all passengers.” This was the last hurrah for Charles Tyson Yerkes, the last line of his transit empire, and he spoke on this day only of the development that would come to the north side of the city because of the new railroad line. After attempting to pass around a million dollars in bribes to get exclusive rights to operate a city-wide transit enterprise for a period of hundred years in 1899 – and failing to get the appropriate legislation passed – he was persona non gratain the exclusive social circles of the city and at City Hall. By the end of 1900 he had sold the majority of his Chicago transit holdings and departed for New York. 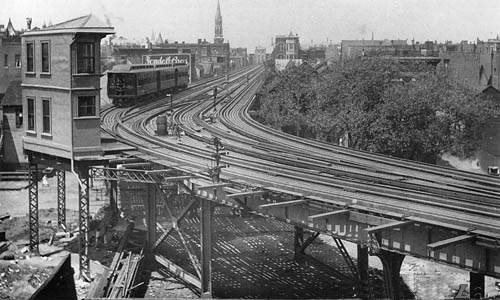 The Northwestern Elevated Railroad still exists today – hop on the Red Line in the Loop and head north. The above photos show the railroad under construction and as it appeared at about the time of its opening. May 31, 1960 – The Chicago Daily Tribune reports that four Chicago architecture firms are joining together to plan “a glass and steels structure” [Chicago Daily Tribune, May 31, 1960] that will replace the federal courthouse. 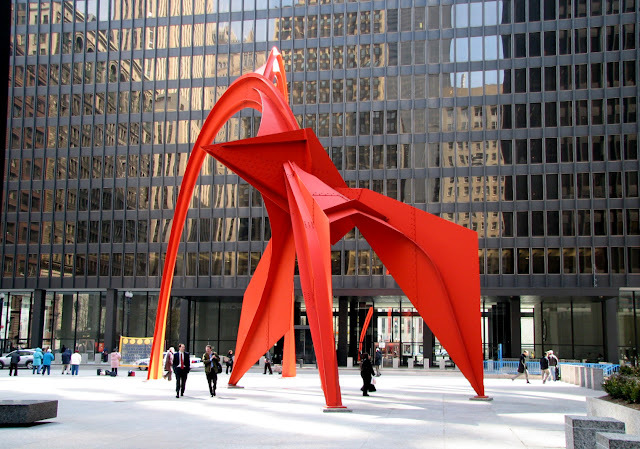 It will sit on the east side of Dearborn Street between Adams Street and Jackson Boulevard, providing more than 1.3 million square feet of space for somewhere around 5,500 employees of the United States courts and 19 federal agencies. The paper reports that “The surrounding walks and plaza, as well as the lobby floors, will feature granite paving. The lofty first floor of the 30 story building will be devoted primarily to the lobby, stairways, and 24 elevators.” Plans include air conditioning and “if conditions warrant, atomic bomb shelters.” Completion date for the building is slated for late 1963 with final drawings due by the end of 1960. This will be the first of two tall government buildings that will replace the old courthouse across Dearborn Street, a building that will be razed as the courthouse is being constructed so that a new federal building can be constructed in its place. The architectural firms involved in the project were: the office of Mies van der Rohe; Schmidt, Garden, and Erikson; C. F. Murphy; and A. Epstein and Sons. 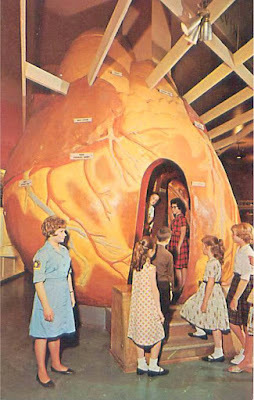 May 31, 1952 – Major Lenox R. Lohr, president of the Science Museum, today’s Museum of Science and Industry, announces that visitors will soon be able to walk through an 18-foot heart, part of a 3,000 square foot exhibit sponsored by the Chicago Heart Association. As part of the experience a human pulse will be audible. In another part of the exhibit the circulation of blood will be illustrated. The heart would fit into the chest of a 28-story human, which will make the museum an educational facility with a very big heart, indeed.